If you are to play, and the number of plays at the current temperature is odd, you have tedomari. If it is even, you do not have tedomari. In order to get it, you have to change the parity of the number of plays available. This can mean playing a move that denies your opponent two moves. This means you have "taken" three moves with your play, so an odd number of plays becomes even. In practical terms, usually you deny your opponent one move simply by playing where he would like to play (Your Opponent's Good Move Is Your Good Move). So you need to also deny him a potential follow-up move, and you will grab tedomari. Bill: How about an example? The other possibility for gaining tedomari is to play a move that gives you two independent follow-ups at the local temperature. Bill: I think that he means that they are miai, and so cancel out. I'm sure there are other tricks, anybody want to post some? Bill: (Much, much later.) Reading this again, I think maybe he's got it backwards. Generally you want to allow your opponent plays with follow-up moves of the same size, because that gives you more chances to make the last play. For instance, Black facing an up plus a star should not play the up, which has a follow-up for White, but should play the star. Now when White plays in the up, Black can reply in the follow-up move and get the last play. Discussion following Robert Pauli's example on main page, moved to Calculating a Thermograph. Bill: Thanks, Andy. :-) However, that is not really a tedomari problem. See Numbers. Bill: Sure. The point of the numbers problem is making the largest play. Here Black plays correctly and holds White to 6 points. Black also gets tedomari. Here Black plays incorrectly and lets White get 7 points. However, Black still gets tedomari. tapir: How much can I gain by Tedomari? The amount temperature drops after the specific tedomari? So how much would it be worth to get the last opening big point, the last big endgame point and the last point? Bill: Assuming otherwise correct play, the most you can gain by getting tedomari is how much the play gains. But let's suppose that the hottest plays on the board are a number of plays that each gain T, the ambient temperature. Then the temperature drops to T1. We may estimate the gain from playing at any temperature to be half that temperature. So we estimate the gain from getting tedomari as T - T1/2, since the opponent goes first at temperature T1. 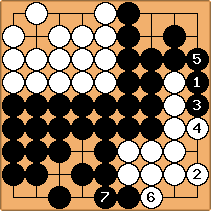 If the opponent gets tedomari instead, the estimated gain is T1/2. The difference between these two estimates is T - T1, the drop in temperature. So the estimated gain of getting tedomari versus losing it is the drop in temperature. 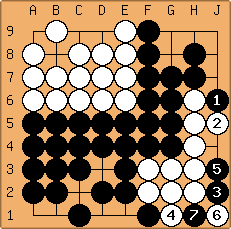 As for the value of various tedomari, I think that usually the gain from getting the last big point in the opening is 1 to 2 points, the gain from getting the last point of the game is usually 1 point, and the gain from the last big endgame point is usually 2 to 3 points. The last is bigger, because often you cannot say that there is a last big endgame play, so that when you can, the drop in temperature is significant. These values are just my opinion. tapir: Can one consider ko as a temporal increase in temperature which falls back to average after resolving the ko / playing out the last threat. Would not a ko fight then be just a variant of a fight over tedomari? --Jesusin (3K): I am confused about the following position. 2. f g d a c leads to Black winning by one point. Please help me! I can't understand it! Stones are balanced (it's Black's turn) to be realistic but also to be applicable to other rulesets. Ko aji disappeared (years too late, I fear ;-). White's ambiguous sente at a in the original setup (4*0 = -2 + 0 + 1 + 1) turned true (4*0 > -4 + 0 + 1 + 1) without changing anything. After you solved the problem, and before you proceed in the original thread, take two copies and try again! Bill: First, to address the life and death issue. After White 2, Black 3 makes ko. 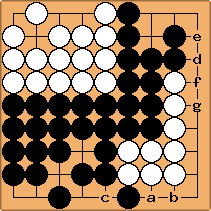 If White 4, Black 5 and White cannot play at a. Another way to make ko. 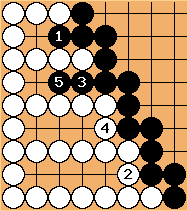 Robert Pauli: (Years later) As far as I see, Bill, the ko aji does not matter: White now takes at the right edge (J7). Then Black should connect his hane on the lower edge (E1), letting White win the ko and jigo (J7 / E1 J1 / J8 J4 / J6 pass / J7). 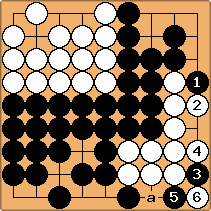 If Black instead fills the ko (J1), he loses (J7 / J1? E1 / J8 J4 / J2 J1 / H1 J3 / J6 J1 / J7 = W+3), provided White does not prematurely take four. Besides that, it would have been much easier and preservative to simply add two stones to get rid of the ko aji: at J2 and right above. Here a is a simple one-point gote play. At b is an one-point ambiguous play. 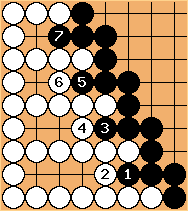 They both have the same value, but Black to play prefers a, while White to play prefers b. After White b, a and c are miai. 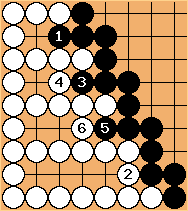 The players prefer different plays because they are trying to get tedomari, the last play. Getting the last (one point) play does make a difference of one point, here. Getting the last one-point play is discussed in Chilling, Infinitesimals, Playing Infinitesimals, and so on. In terms of infinitesmals a is * (STAR) and b is ^ (UP). ^ has an atomic weight of 1, while * has an atomic weight of 0. Atomic weight is similar to the count of external liberties in a semeai. 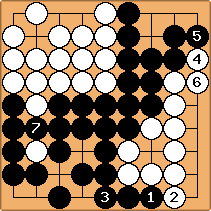 A white play at b changes the local position (c) to *, with atomic weight of 0, reducing Black's atomic weight by 1. That is like filling one of Black's liberties in a semeai. A Black play at a does not change the atomic weight. That is like not filling one's own liberty. But you have to take miai into account. In this diagram a and d are miai. 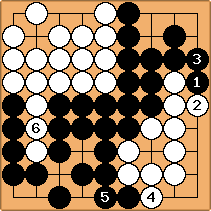 That means that Black should play at b to get tedomari. Black wins by one point. 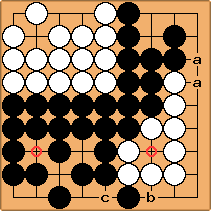 If Black 1 (or 6), White gets tedomari, for jigo. --Jesusin (3K): SL's Lord Of The Yose is always right ;-). Thanks for the enlightment, Bill. Here a is a 1/2 point gote [and b a 1 point reverse ambiguous sente]. If it was White's turn, she would take her sente at b and then a to win. 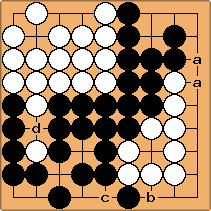 If it is Black's turn, Black b, White plays atari, Black connects, White a is jigo. And Black a, White b, Black connects is jigo too. PJT: What is an “ambiguous sente”? Is this in the sense that ambiguous moves are so close to sente they are often answered? Bill: Basically the size of a play is a local phenomenon. It is not true that, on the whole board, the largest play is always the best play, nor that two plays of different sizes always lead to different results. Let's alter your example slightly. White a has a miai value of 1/2 [= (0 minus -1) / 2], while White b has a miai value of 3/4 [= (-1/2 minus -2) / 2]. On this board, however, White gets the same result with either. After White 1, White 3 gets tedomari, for jigo. Now Black gets tedomari, but the result is still jigo. In the first case, White gained 1/2 point, then lost 3/4 point, then gained 1/2 point, for a net gain of 1/4 point. In the second case, White gained 3/4 point and then lost 1/2 point, for a net gain of 1/4 point. All same same.